The compact and affordable M10-W wireless cameras are ideal for use in homes and small businesses, with the M1004-W being Axis’ least expensive camera at only $200. The plug-in power supply, quick mount stand, and wireless connectivity over standard wi-fi networks makes them ideal for temporary and semi-covert applications. The cameras can also be hard-wired using an ethernet cable for more permanent installations. For an additional $130 the M1034-W adds a built-in speaker and microphone providing 2 way audio, allowing you to not only see activity on site from a remote location but also listen in and speak to a person on site using a PC or smartphone. Another interesting feature of the M1034-W is the built-in PIR motion sensor and light. The light can be programmed to turn on when the motion sensor is triggered allowing you to see an intruder even in a darkened room. Another model, the M1014 is similar to the M1004-W except that it trades wireless connectivity for an SD card slot which enables on-board recording of video footage right on the camera. 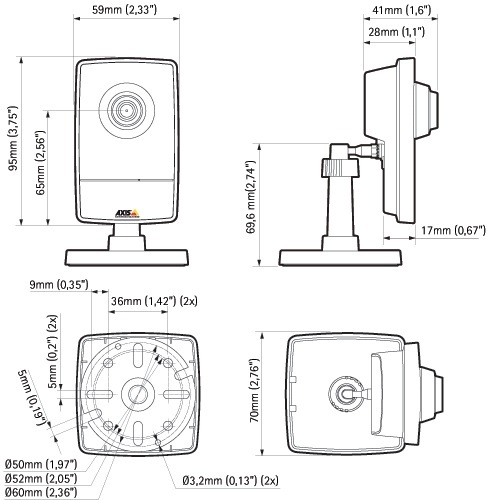 In addition to the standard mount/stand all M10 series cameras come with a clamp mount ideal for temporary installations. Axis M1004-W: 720p resolution, wireless (wi-fi) or wired connectivity, 80 degree field of view, alarm input/output, plug-in power supply. Approximate cost $200. Axis M1014: 720p resolution, 80 degree field of view, SD card slot for on board video recording, plug-in power supply. Approximate cost $230. 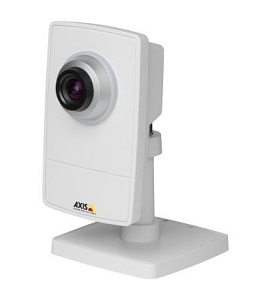 Axis M1034-W: 720p resolution, wireless (wi-fi) or wired connectivity, 80 degree field of view, alarm input/output, two-way audio with built-in speaker and microphone, plug-in power supply. Approximate cost $330. Lens: All models – 2.8mm fixed focal length, 80 degree horizontal angle of view. Power: All models – Plug-in DC power supply included. Additional features: separate indoor module for processor and SD card included, standard and clamp mounting brackets included.